Are you thinking of buying a condo or a house in the near future? 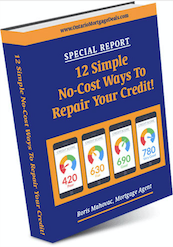 If you know you have poor credit, you need to know how to repair credit. You may have been told that your have poor credit, which is anything under 500, too low for most lenders to approve you for a mortgage. In case you are not currently using any credit products, you have no active “trade lines” on your credit report. This refers to any credit products you may have, including credit cards, department store credit cards, loans, cell phone accounts, etc. In order to get you to a place where you need to be — credit-wise — you need to establish good credit. One way of doing that is to get a so-called secured credit card. Basically it’s like a regular credit card, the main difference is instead of granting you credit up to a certain limit, you make a deposit to the card and then that becomes your “credit limit”. In other words, the card issuer does not grant you any credit, since you’re using your own money. Makes sense? However, if you do use this card regularly and pay the bill on time and in full, this activity will be reported to credit bureaus, and that will, eventually, increase your credit score. Getting a card like this is virtually guaranteed because of the security deposit is in place. Ideally you should have 2 trade lines for a minimum of 12-18 months activity to see improvements in your credit score. The other one is CapitalOne. Also, if you’re in a mall or department store and they have special offers to get a BAY card, or any store credit card, apply for it and see if you get approved. Make sure you tell them that you have poor credit. If you have any questions about how to repair credit, you can reach me 9am-9pm, 7 days a week.